I have several gardens that I keep for butterflies, birds, bees or whomever else might want to come visit. I plant native plants and then I just kind of let nature take its course. But there does come a time when some weeding or other upkeep needs to be done. There has been some kind of woody vine coming over my back fence and taking over my oleanders. It’s going to be a big project to get rid of it all and I have been waiting for the weather to cool off a bit. But the other day, I decided to tackle a little bit of it. I was taking handfuls of the plant and pulling it off the oleanders, occasionally having to cut the vine attachment off of my plants. I was surprised by this green caterpillar as I was discarding this section of the vine. He sure does blend into the greenery. I re-homed him to an area that I had not cleared out. You can bet I was extra careful after that, checking for visitors among the vines before I disposed of them. This green caterpillar is the larvae for the Waved Sphinx Moth (Ceratomia undulosa). This is a very common moth with a wingspan of up to 4 inches. It can be found in throughout the eastern United States. The caterpillars pupate in the soil and the adult moth emerges 2-3 weeks later. The moths are named for the black wavy lines on the wings. They also have a distinctive white dot on each wing. This is a great example of how you never know what surprises Mother Nature has hiding in your own backyard. This pretty flower belongs to a Texas Star Hibiscus (Hibiscus coccineus). 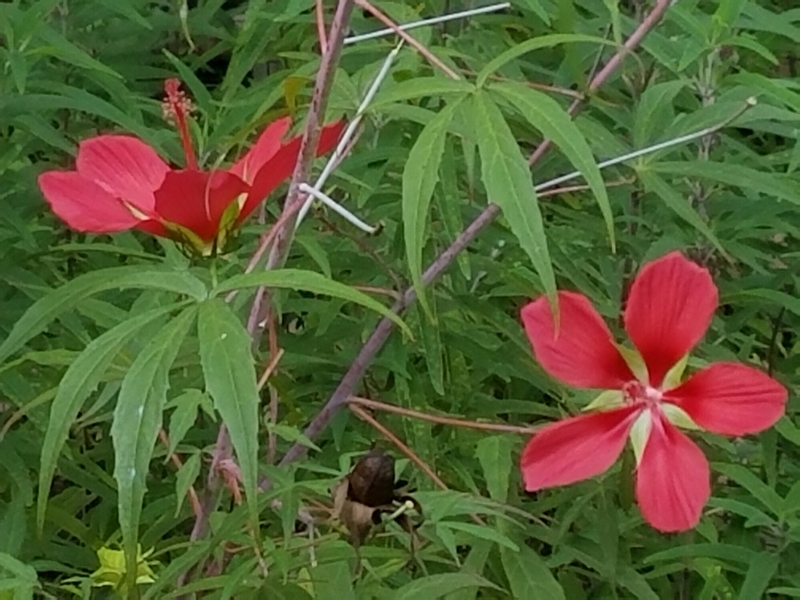 It also goes by Scarlet Rosemallow and Swamp Hibiscus. It does not look like a typical hibiscus flower and the flower is one of the largest blooms in Texas. The five-petaled crimson flower grows anywhere from 3-6 inches wide. There is also a much rarer white-flowered version of this hibiscus plant. The curious thing about this plant is its leaves. Palmate, star-shaped, and serrated, the leaves are often mistaken for those of a marijuana plant. Northwest Harris County resident Blair Davis learned this the hard way when the Harris County Organized Crime Unit raided his home. A neighbor had reported that he was growing marijuana in his front yard. But it was actually Texas Star hibiscus that he grows for his landscaping business. Here is the Fox News story. This beautiful perennial is a low maintenance plant when planted in wet or swampy soil. It likes full sun and will grow in dry soil as long as it is watered frequently. I do not have any swampy areas in my yard and I am not a practitioner of frequent watering, so I will have to rely on enjoying this lovely shrub elsewhere. I found this fine specimen at the Houston Zoo in a butterfly garden. Texas Star attracts butterflies and hummingbirds. Finally, I just want to add that the name Scarlet Rosemallow needs to be the name of a character in a book, don’t you think? Today I was at the Houston Zoo. I was attempting to take some pictures of butterflies, but they were not being very cooperative, especially the beautiful swallowtail I was trying to get to pose for me. So I decided to start taking pictures of the beautiful plants and flowers instead because they pose much better than butterflies do. I encountered this really cool looking tree. I asked one of the Zoo’s horticulturists what this amazing plant was and he told me it was a Buttonbush. Buttonbush (Cephalanthus occidentalis) is a small tree found in wetlands that can reach 8 to 15 feet tall. The 1-inch diameter flower clusters bloom from June to September. Flowers mature to a fruit that turns golden brown in autumn. It attracts insects, butterflies, and bees with its nectar. Birds eat the fruit. I’m sure the reason I am not familiar with this lovely tree is that is likes moist soil, which does not exist in my yard. Just goes to prove the wonderful world you can discover if you just look around you. My plumeria plant bloomed this year and I am loving the beautiful, fragrant flowers. It never bloomed last year. I believe it is because I did not water it enough. This year we have had so much rain here in the Houston area, that many of my plants are happier than usual. I have not had an easy time with plumeria. The first one I bought died because I did not protect it from the cold. I bought another plant the next summer. After some research I learned that it must be brought inside when temperatures fall below 40 degrees. So that winter, as soon as the temperatures dipped, I moved my potted plant into the garage. It lost its leaves, but survived. I brought it back out in the spring and watched it green back up, to my relief. But it never bloomed that summer. So last winter, it went into the garage again. This spring I brought it back out and watched it green up again. Then it rained and rained and rained. Now my plumeria is blooming and I am thrilled to get to enjoy its beauty once again. I found out some very interesting facts about plumeria while preparing to write this blog. Plumeria Rubra is also known as the Common Franginpani. It is related to the oleander and also contains a poisonous sap. The flower is often used in Hawaiian leis. Also this wonderful tidbit thanks to Plumeria.Care: Plumeria flowers are most fragrant at night in order to attract sphinx moths. The moths are lured by the fragrance, thinking they will get some nectar. However plumeria flowers have no nectar, but they are pollinated by the moths as they fruitlessly search for the nectar. Sneaky! Mostly what I have learned is that Plumeria likes a lot of water, and that I should be fertilizing it more frequently. So maybe I’ve just been really lucky this year, but now I know what to do in future years to ensure production of these gorgeous fragrant blooms. Turks Cap (Malvaviscus drummondioi) is one of my very favorite plants because it is so easy to grow. It is a native shrub that attracts birds, butterflies, and hummingbirds. It blooms from May to November, adding a colorful element to my garden from spring through fall. According to the Lady Bird Johnson Wildflower Center, this plant is named for the Scottish naturalist Thomas Drummond. He spent almost two years in Texas in the 1830’s collecting an extensive array of plant and bird specimens. As I was taking pictures of the flowers on this plant in my backyard, a young grasshopper photobombed me. Obviously this was the picture I had to use for this post. I hope he does not grow up to eat my entire garden. This little honey bee (Apis mellifera) is visiting my newly planted Vitex tree (Vitex agnus-castus). I have wanted to plant Vitex in my back yard for a while, so over this long Memorial Day weekend I finally planted two small trees in my back yard. These deciduous shrubs/small trees are beautiful and they attract hummingbirds, butterflies, and bees. They are also commonly known as Chaste trees. Now I get to enjoy the beautiful lilac flowers that this tree produces through the spring and summer, with the benefit of admiring the amazing creatures the flowers attract. This is one of the many green anole lizards that live in my back yard. They are fun to watch as they sun themselves. I can usually find any number of them sunning themselves on my plants, fence, windows, and even my patio furniture. They also drive my dog crazy, playing hide-and-seek with him until we have to force him back into the house. They have adhesive lamellae on their foot-pads. Their color, which can range from green to brown to grey, is dependent on their mood, temperature, humidity, and health. Males have a pink dewlap, which they use to attract females and protect territory. They eat small insects and spiders. Male green anoles react to a mirror image of themselves and may act aggressively toward it.